The seats, all 4,300 of them, are empty. The bright red and white lights on the marquee facing North Broadway have been dark for nearly thirty years, and the letters signifying the theater’s name along its eight-story Spanish Baroque-inspired façade are all long gone. Tribute websites, faded volunteer-hung posters and historical stage production listings read like a who’s-who of rock luminaries: Bruce Springsteen; Elvis Costello; The Grateful Dead; Frank Zappa; The Allman Brothers Band; Prince. Even today, more than eighty years after its grand opening, it still boasts the second-largest seating capacity of any indoor theater in America, surpassed by only the famed Radio City Music Hall in New York City. And yet, for all the history and renowned design housed within its 43,000 square feet, the Uptown Theatre in Chicago has stood empty and lifeless since 1981, its hollow interior and decaying exterior both ghostly testaments to years of neglect and the fleeting nature of urban prestige in America. 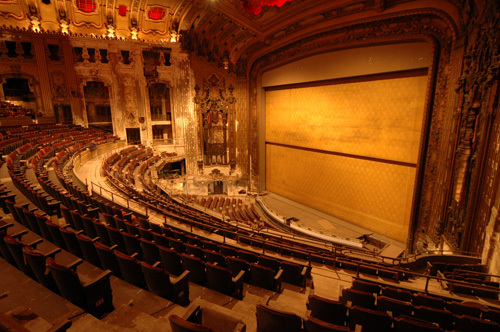 First opened in 1925, the Uptown was considered the finest of the 50 Balaban and Katz theatres in the Chicago area. At the time, the Uptown stood side-by-side with the 2,300-seat Riviera Theatre and 2,500-seat Aragon Ballroom to form the Uptown Square entertainment district, the city’s then-undisputed cultural epicenter. In the years immediately after its grand opening, the Uptown achieved national prominence in a very short amount of time for its lavish interior and spacious design, including a 10,000-pipe Wurlitzer organ and seventy foot wide stage. The Uptown’s upscale intentions were a perfect match for the tide of riches the 1920s had brought to the city, but with the onset of the Great Depression the Uptown and its surrounding neighborhood took a serious economic nosedive. Residents could no longer afford the premium ticket prices the Uptown commanded, and most people with the money to buy tickets didn’t have the funds to make their way to what was then the far northern edge of the city. Balaban and Katz struggled to keep the theater open, its presence eventually becoming more important symbolically than financially. The mighty exterior still cast its red and white glow onto Broadway, but interior trappings were slowly and quietly sold off one-by-one to cover the increasing costs of owning what was fast becoming a failing venue. The Wurlitzer was the first to go, with the theater’s 18 marble sculptures and 90 oil paintings following not far behind. In 1969, the American Broadcasting Company bought the Uptown from Balaban and Katz with the intention of converting it to a full-time movie house in the Plitt Cinemas chain. The neighborhood, however, still had not fully recovered from the previous decades’ economic troubles. Crime in the area – both actual and perceived – kept the Uptown from returning to its former glory and ABC, growing increasingly desperate to make its money back, followed the advice of community planning groups and ran the Uptown primarily as a concert venue. Its mammoth stage size and large seating capacity put the Uptown in a unique position among venues not just in Chicago, but throughout the Midwest. Bands were no longer restricted to the either-or proposition of either booking clubs too small to make their trip to Chicago worth the operating costs, or else booking an arena they simply did not have the local fan base to fill. Its location in what was perceived as an edgy neighborhood gave the Uptown an additional credibility as a venue for a more authentic type of performer, and being an indoor venue meant larger acts were not confined to summer-only stops in Chicago. Through its new booking strategy, the Uptown was at least back to life as a viable (though not extremely profitable) business venture. Although plenty of premier acts made their way to its stage, the theater gained perhaps its biggest boost in concert-going circles following an October 11, 1980 Bruce Springsteen gig that lasted just over five hours and is still widely acknowledged as one of the Boss’ best – no small designation considering both his reputation as a premier show and the literal thousands of shows he’s done on some of the finest stages in the world. Finally, Chicago had its answer to the Allmans’ legendary shows at New York’s Fillmore East or the Stones at Los Angeles’ Hollywood Palladium. But as fate and decades of neglect would have it, the good times were not meant to last. In the winter of early 1981, theater ownership shut off the heat throughout the building to contain utility costs; as temperatures outside plummeted, the water inside the building’s pipes froze and expanded until those pipes finally exploded. Ice-cold water flooded the lower levels of the theater and eventually froze over, its damage rendering most of the entire building unusable and the staggering costs of repair leaving ABC no choice but to either sell the property or leave it for dead. Throughout the 1980s and 1990s, the city of Chicago and several urban conservation groups worked to leave the structure standing as-is, including successful lobbying in 1986 to have the Uptown added to the National Register of Historic Places. Such moves have at least kept the theater on life support, but in the decades since its closing to the public the theater hasn’t seen much activity outside of a few movie shoots and some private parties in the mid-1990s. Several groups have attempted to purchase the Uptown in recent years, but deals have never been able to pass as the theater is essentially ownerless: the building and the parcel of land it sits on were divided up to creditors as separate assets, $1.8 million worth of mortgages on both have since gone into default, and an additional $1.7 million are owed in back taxes and municipal repair charges. Further complicating the Uptown’s future are the estimated $40 million in renovations needed to return the theater to any kind of useable condition, severely reducing the number of potential buyers to all but the most well-heeled developers or promoters. Rumors flew in 2006 and 2007 over both Live Nation and Jam Productions trying to buy up the vacant property, but concrete details have never surfaced regarding either of those possible transactions. Still, the great irony is that the largest barrier to the Uptown’s return to glory may be Chicago itself. With the restoration of several prominent venues in the Loop, the downtown Theater District has created a veritable syndicate of stages located near each of the city’s major highways and public transportation terminals, and with ample parking – and all residing in a surrounding neighborhood less ominous than the arguably block-by-block zones of safety cradling the Uptown. Making matters worse, the Uptown’s neighboring Aragon and Riviera have since been bought up by Viva Entertainment and Jam Productions, respectively, leaving those two mega-promoters little incentive to take on such a sizable investment that would simultaneously cannibalize their existing business interests. And so the theater and the neighborhood sit together in awkward silence, linked forever in name and need for someone – anyone – to come along with money to burn and a vision for the area neither city nor stage has seen since Balaban and Katz first set eyes on both back in 1925. Uptown searches for a much-needed shot in the arm while its Spanish Baroque namesake sits back with shuttered doors and empty seats, both longing for those red and white letters to light up the night on North Broadway once again.